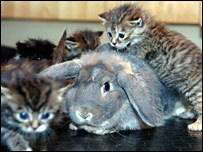 Six abandoned kittens have found an unexpected new mother figure - a pet rabbit. Veterinary nurse Melanie Humble took the three-week-old kittens to her Aberdeen home. The kittens seemed to think Summer the rabbit was their mother and began to climb all over her and try to feed from her. Efforts will be made to find the four males and two females permanent homes in the coming weeks. Melanie, 29, told the BBC Scotland news website: "The abandoned kittens were handed in when they were about three weeks old and I took them home. "Summer the rabbit was taken inside on Bonfire Night because of the fireworks and the kittens seemed to really like her and thought she was their mother." She added: "They were trying to get milk from her and climbing over her. And Summer was not bothered by them at all. "Summer is five months old and she's gigantic. It is lovely to see them all together. "They are all doing well and Cats Protection will re-home them."